In Central America, the black-handed spider monkey (Ateles geoffroyi) makes its home high in the rainforest canopy. The long limbs and prehensile tails of these primates give them their name. They commonly dangle by a limb or acrobatically swing from branch to branch. Black-handed spider monkeys are highly social and live in large, complex communities. Black-handed spider monkeys organize themselves in larger communities of 18 to 30 members consisting of multiple adult males and females, infants and juveniles. The entire group comes together in the evening, but during the day the monkeys break off into smaller subgroups. While these groups have varying purposes, most of them are dedicated to foraging for food. Group size is dependent on the density of food in the area. Fruit makes up the bulk of their diet. 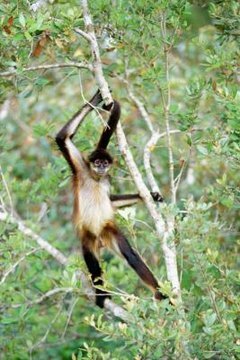 Male black-handed spider monkeys travel greater distances from the communal center than females, either in search for food or in territorial defense patrols. If an individual discovers a large store of fruit, a loud call alerts other members of the group, who will come take advantage of the find. Males are the only black-handed spider monkeys who perform this long call, and juvenile males spend longer periods of time with older males as they mature to learn and perfect their own call. Males have also been observed partaking in extended social grooming sessions. Black-handed spider monkeys give birth roughly once every two to four years. They have no specific breeding season. Females choose mates and initiate mating. If she becomes pregnant, she gives birth approximately eight months later. The relationship between mothers and their young is the only lasting relationship between two black-handed spider monkeys. The mother carries her infant at her belly continuously for the first five months of its life, at which point the infant rides on its mother’s back. Juvenile spider monkeys, between 2 and 3 years of age, start to act independently of their mother, often forming groups with other juveniles. Distinctions between male and female behavior begin once black-handed spider monkeys are between 4 and 5 years old. These sub-adults have just reached sexual maturity but are not yet actively breeding. At this age, females remain close to their mothers and will assist with younger siblings. Males gravitate towards other males, both adults and sub-adults, spending less time with their mother.